Mr He was appointed Deputy General Manager of the Company in July 2016. 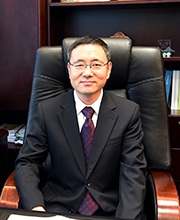 He served as General Manager (external assignment) of Guangzhou North Second Ring Expressway Co., Ltd. from September 2014 to October 2016, Engineering Director of Yuexiu Transport Infrastructure Limited from August 2014 to July 2016, and General Manager of Engineering, a senior road and bridge engineer, and a registered civil engineer of Yuexiu Transport Infrastructure Limited from December 2011 to January 2015. He graduated from the Changsha University of Science & Technology with a master’s degree in architecture and civil engineering, and from the Department of Civil Engineering, Changsha Communications University with a bachelor’s degree in highway and urban road engineering.